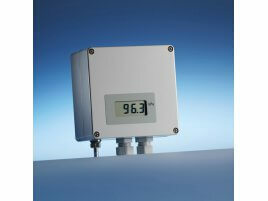 The AD 1000 absolute pressure transducer is designed for displaying atmospheric pressure (BA 1000) and absolute pressure. At the heart of the unit is an evacuated measurement cell made from an elastic copper material. The deflection of the measurement cell due to absolute pressure is measured inductively without making contact. The transmitter emits an electrical output signal proportional to the absolute pressure. The device can be powered using a 24 VDC power supply or a variety of AC voltages. The pressure port is led through in the AD 1000 making it suitable for measuring absolute pressures in closed systems.